The Rockne Athletic Fund is an athletics giving fund at Notre Fame named for legendary football coach Knute Rockne. A sports marketing project challenged the class to redesign the fund from a visual and structural perspective. From that challenge came the proposed Knute Rockne Heritage Fund. The design calls on iconic imagery from Notre Dame’s athletic facilities. The identity balances Notre Dame's traditional tendencies with contemporary influence. Fort Foundry’s GIN, a sturdy block with sharp, modern serifs, is the primary typeface. It sets the tone, equal parts athletic and serious. The logo's holding shape recalls the domed roofs atop Notre Dame's stadiums of today and of the past. Deep forest green paired with creamy gold are an elegant interpretation of the school's classic colors. Collateral features gold foil hits, an elevated finish mimicking ND's famous gold helmets. A pattern detail based on playing surfaces reminds of the athletes at the center of the fund's mission. 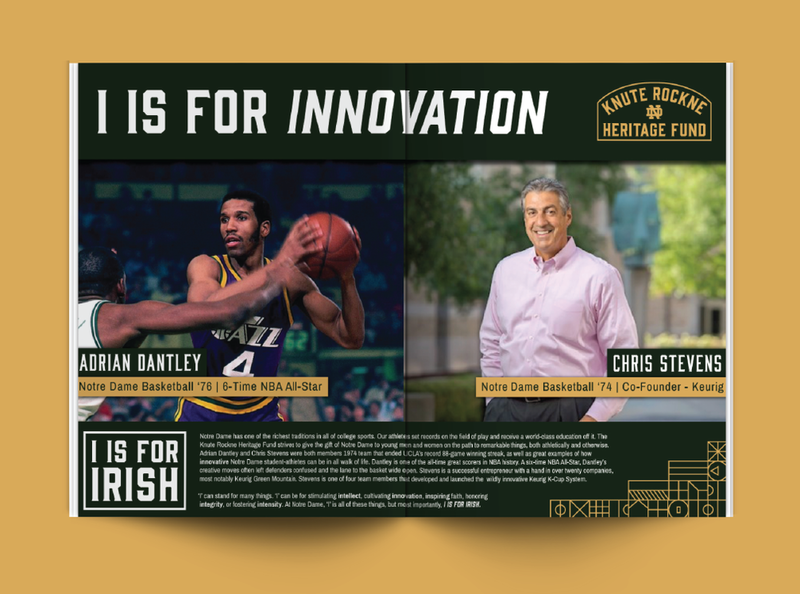 The campaign focuses on success stories of former Notre Dame athletes on and off the field. The spread above features Adrian Dantley and Chris Stevens. They were both members of the 1974 basketball team that ended UCLA’s 88-game unbeaten streak. Dantley went on to a Hall of Fame NBA career, while Stevens became a founder of Keurig. The overarching message is that a gift to the KRHF will set student-athletes up for lifelong success.